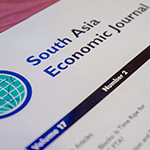 The IPS was instrumental in launching the South Asia Economic Journal (SAEJ) in 2000 under the aegis of the SAARC Research Network. SAEJ is a refereed journal published bi-annually and jointly managed with the Research and Information System for Developing Countries (RIS) of India, and published by Sage Publications, New Delhi, India (http://www.indiasage.com/ ). Representatives from each SAARC country constitute the Editorial Board of the Journal with the SAARC Secretary-General serving on it as an ex-officio member. Senior scholars and eminent persons from SAARC countries constitute the Editorial Advisory Board. The objective of the journal is to disseminate economic research findings and promote policy debates pertinent to South Asia. You may find title of recent articles of SAEJ by clicking the links below. Details of the journal as well as submission guidelines and other relevant information are on the SAGE Publications India Pvt Ltd web site. The Journal has been evaluated and accepted for inclusion in EconLit (www.econlit.org), the electronic indexing and abstracting service of the American Economic Association.